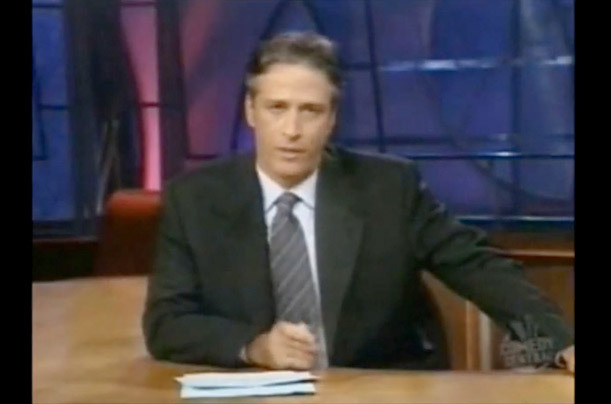 Stewart became the host of The Daily Show in early 1999. Since then, he has addressed almost every major issue that has confronted the U.S., from the surreal to the sobering. On his first show after the Sept. 11 attacks, a visibly stricken Stewart took a somber tone while addressing his audience. "I'm sorry to do this to you," he said. "It's another entertainment show beginning with an overwrought speech of a shaken host, and television is nothing if not redundant. So I apologize for that. It's something that unfortunately we do for ourselves so that we can drain whatever abscess is in our hearts and move on to the business of making you laugh  which we haven't been able to do very effectively lately."